The next 9.7‑inch iPad will get a lot skinnier, and get bit lighter, thanks to new screen construction that follows that of the iPad mini. Instead of a glass touch panel, the next Apple iPad will use a film-based touch panel, a thinner layer that sits between the liquid-crystal display (LCD) layer and the protective glass front layer. The Wall Street Journal reported the news this morning, citing sources close to Apple’s suppliers in Asia. A lighter iPad will be a welcome improvement, after the third and fourth generation iPads with Retina display added some weight to the device. 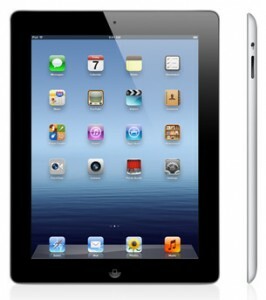 Apple’s iPad 2, at 1.33 pounds (601 g), was actually lighter than the models that followed. The current iPad weighs in at 1.44 pounds (652 g). A thinner iPad would also make it easy to hold on to, you might think. The thickness of the current model is 0.37 inch (9.4 mm), that’s also thicker than the iPad 2 which has a depth of 0.34 inch (8.8 mm).